“Siri. Answer the question that i want to ask”. That’s how easy i want the internet to be – think for me and find it before my fingers can type, swipe, or touch the words or icons that i need to find. I want information now. I want my information highway to be Montgomery Scott “She can’t take anymore Captain” fast. I can hear brother-in-spain saying “Use Google and you’ll find it soon enough”. Well i’m sorry but we both know that’s not soon enough. I searched for almost 5 entire minutes before i could find the list of Beaujolais Nouveau wines that will be released at the LCBO this Thursday. I know there’s a certain irony that most people “poo poo” Nouveau because it doesn’t age and is ready too quickly for their liking. Nuts to them. I like “new Beaujolais” [rough translation] and i want it now! Here’s what you can expect from the Nouveau at the LCBO this year. The wine will be young, effervescent, and fruity, and red, and in a bottle until you get it into your glass [unless you follow brother-in-spain’s advice and use a twisty straw]. Dubœuf and Drouhin will each have a Beaujolais-Villages Nouveau for about $16 – which i still find a ridiculous price for a Nouveau but i’m a sucker and will still buy it. I hope lots of people who come to my party buy them. The Italians will make a couple and maybe even an Ontario one – but I dismiss them all because i like to summarily dismiss things – unless the people at Chateau des Charmes make one again this year. I’m tweeting to find out right now but the internet is so slow – yeesh. It’s fun, when you’re 50, to poke fun at the younger generation. So for my Halloween costume this year I went as a “20 something hipster”. One ironic moustache and several well drawn and/or outdated tattoos later I was a hipster. It was also a ruse to allow me to talk about craft beer all night – and I brought a lovely one to the party from Lake of Bays – Stamp Hammer oak aged amber lager. Back to my tattoos for a minute. They were drawn so expertly that everyone assumed they were real. Honestly, the “vital signs” one that flatlines and then says “carpe diem” may become a tattoo if i ever get over my fear of needles and hep b. 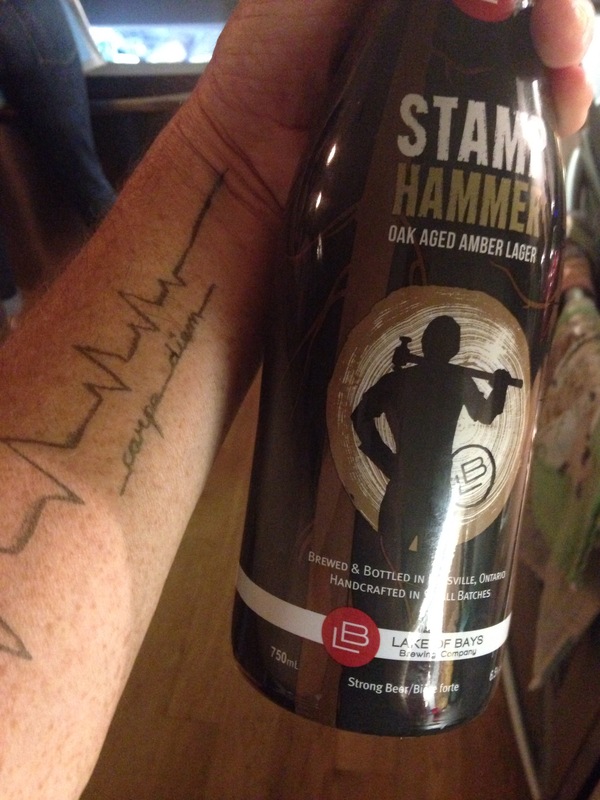 Stamp Hammer is only available in October and November so you may want to stop reading now and go the the LCBO. A dark amber, i found it slightly spicy, not overly hopped, and a vanilla from the oak barrels that rounded the lager out into a smooth finish. Everyone loved it. 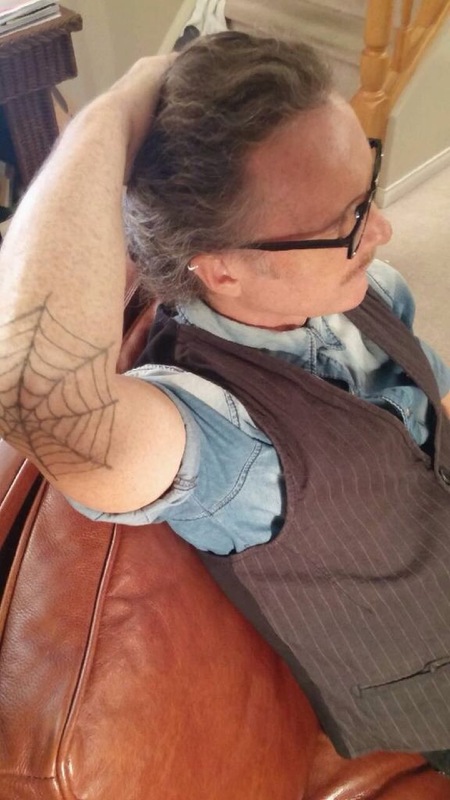 Also, my spider-web elbow ink rocked.